Polls have closed in the election that could decide the future of Spain and Catalonia, as residents of the northern Spanish region voted to choose new lawmakers for the regional parliament. The Spanish government called the election after seizing control of the Catalan administration, following a disputed independence referendum in October. Since then, several independence leaders have been jailed or are in exile. Many have campaigned during the election period via video link. Exit polls suggested that pro-independence parties might keep their absolute majority in the parliament, La Vanguardia newspaper reported late Thursday. It was not clear whether the final results would match the exit poll. The heated independence debate appeared to have brought out voters in big numbers. At one polling station in the central Barcelona district of Eixample, officials told VOA that by lunchtime, the number of voters was roughly double that in regional elections two years ago. Among the voters standing in line in the winter sunshine was Xavier Drudis, a resident of Seattle in the United States. Drudis was back in his home city of Barcelona for the winter holidays, just in time to vote. Pinned to his coat was a yellow ribbon, a symbol of solidarity with the jailed independence leaders. "I believe the society is very divided, so I believe the result is going to be very divided, so I don't think it's going to be a solution. But I also don't think we have to surrender," he said. Local resident Irma Rio was more optimistic. "We are happy that we have elections, because the problems with independence and no independence will be solved," Rio said. Fernando, a central Barcelona voter who did not share his surname, said the election would not solve the political paralysis. "We need to approach this problem with sanity. And not with this. Because things will continue, will be the same," he said. "There are a lot of people intoxicated with the bad information of nationalists." Earlier polls suggested the result could be very close, with no one party gaining a majority, which would most likely lead to lengthy negotiations involving the parties and attempts to form a coalition regional government. Early polling suggested voters were evenly split between pro-independence and pro-unity parties. FILE - Protesters holds banners that read in Catalan '' freedom'' showing the portraits of the inprisoned Jordi Sanchez and Jordi Cuixart, leaders of the Catalan grassroots organizations Catalan National Assembly and Omnium Cultural, during a rally outside the Catalan parliament in Barcelona, Spain, Oct. 27, 2017. The Catalan National Assembly grass-roots campaign group has been at the forefront of organizing the independence protests, and its president, Jordi Sanchez, is in jail on charges of sedition. The vice president, Agusti Alcoberro, told VOA the campaign would go on. "If there is a clear independence majority, we are going to have to debate whether to work with the government or pressure it to go faster," he said. "In case the independence movement does not win, we should rethink the way of acting, but always in a civic, peaceful and democratic way." David Mejia, a candidate for the pro-unity Ciudadanos party, said the independence campaign was a big distraction. 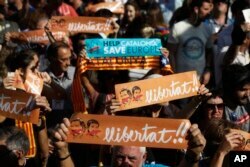 "I believe that Catalonia is losing time and money talking about the independence process," he said. "It is time to put on the table those issues that really matter for Catalan society." The Spanish government was counting on the 58 percent of voters who didn't take part in the disputed independence referendum to back pro-unity parties. Meanwhile, independence campaigners said they thought Madrid's tough crackdown had won them more support. With passions running so high, the race was too close to call.